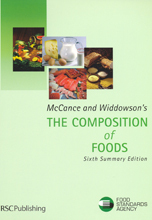 McCance and Widdowson's The Composition of Foods Sixth Summary Edition provides authoritative and comprehensive nutrient data for over 1,200 of the most commonly consumed foods in the UK. This new summary edition, which incorporates data from supplements published since the 4th and 5th Editions, covers all food groups. In addition to new and previously unpublished data, it includes updated information on key foods such as milk, cheese, bread, breakfast cereals, and meat and meat products. There are also new entries for many foods that have become popular in recent years, such as fresh pasta and crème fraiche. Values for a wide range of nutrients (e.g. proximates, vitamins, inorganics, non-starch polysaccharides, and fatty acid totals) are provided. Additional tables cover phytosterols, carotenoid fractions, vitamin E fractions and, for the first time, vitamin K1 (phylloquinone) and AOAC fibre. Aimed at students and professionals in all food and health disciplines, The Composition of Foods remains the essential handbook for those who need to know the nutritional value of foods consumed in the UK.